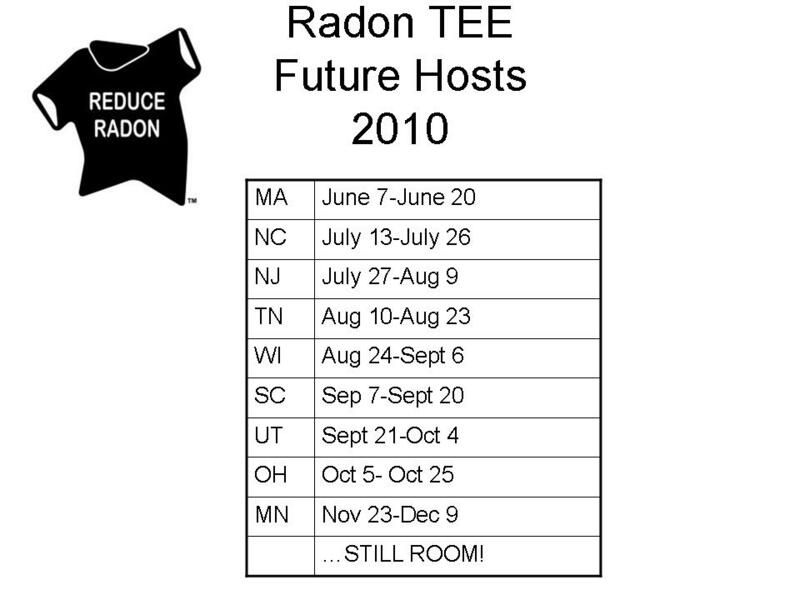 Today I had the great opportunity to facilitate the webinar, “Getting the Most out of Radon TEE.” This particular gathering was designed for state team captains who have registered to be future hosts of Radon TEE in the campaign, Radon TEE World Trek: 2010. Dave Naggar from Mass. ; Angel Price from N.C.; Dennis Vaughn from Tenn.; Aimee Morrow from S.C.; Anita Kopera, Linda Jordan and Pat from N.J.; and Chris Keyser and Mark Jones from Utah were all in attendance. We were also joined by Jeggan Cole from CRCPD and Lou Witt, Gina Bowler and Kelly Hunt from EPA.